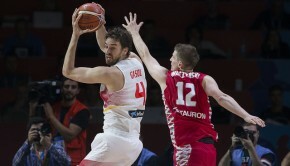 After absorbing a disappointing upset loss in their second assignment, Spain bounced back big time as they pummeled Czech Republic, 60-39, in the preliminary round of the EuroBasket Men 2013 on Saturday in Slovenia. Coming from a 78-69 loss against host Slovenia (link to the article about this game), Spain made sure that they will not give Czech Republic a room to build confidence. The defending European champions started the game with a 6-0 run and sustained the momentum to build an 18-7 lead heading into the second period in which Czech Republic trimmed the lead down to eight at the half. Spain struggled to find their offensive rhythm in both third and fourth periods, but they compensated with their tremendous defense, limiting Czech Republic to just two points in the final period. “I think we played a defense as good as on the first day in the win against Croatia. It’s one of our characteristics, we are a team with the capacity to defend hard and play fast, and I think it’s what we should be doing,” said Spain forward Pablo Aguilar after the game. 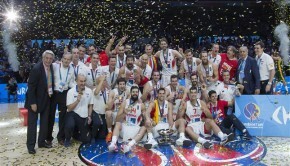 Rudy Fernandez starred for Spain as he finished with 14 points to go along with eight rebounds and four steals, while Ricky Rubio added 10 points and three assists. Star center Marc Gasol only had two points, but grabbed 10 rebounds for Spain, which shot just 32.4 percent from the field. Despite having a poor offensive night, Aguilar expressed confidence that their team can get out of their current slump as tournament goes along. “We know that this team has tremendous offensive potential so I don’t think anyone should be worried. I think that if we keep working it will come, it’s a question of time, I am convinced,” Aguilar said. 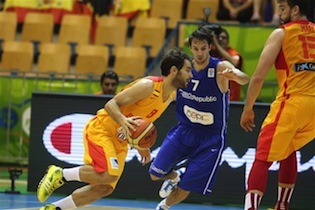 Spain will face Poland next on Sunday at the Celje Arena in Celje.